Gaskill Ranch, Volborg, Mont., were repeat buyers at the Mt. Rushmore Angus sale. 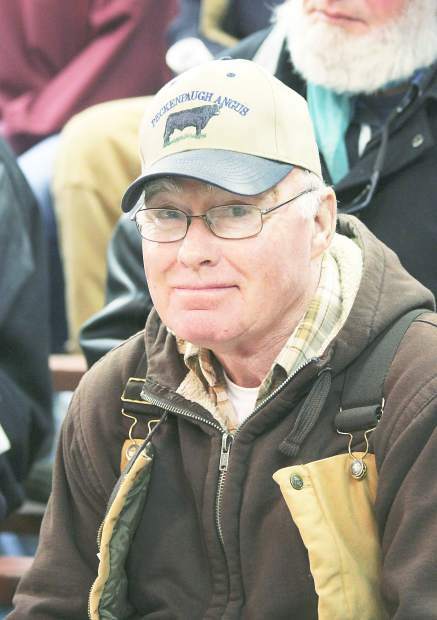 Bob Peckenpaugh, Carthage, S.D., bought a couple of top herd bulls at the Mt. Rushmore Angus sale. Mt. 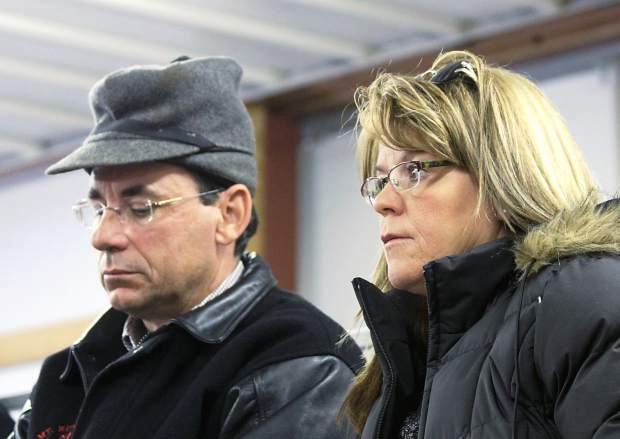 Rushmore Angus, owned by Eddie and Marty Rypkema and their family, hosted probably their biggest crowd ever for their annual bull sale held. I've personally watched the improvement of these cattle, and they are now producing one of the top quality Angus sales in Western South Dakota. Ranch manager David Urig and his brother, Justin, along with Shane Lyon, have produced energy, fresh genetics and a lot of excitement around this ranch. The ranch is a beautiful setting for this good set of Angus cattle. It was plenty cool on sale day morning with some new snow, but none of that could dampen the enthusiasm of this bid crowd as every bull found a new home. Top selling bull of the day was Lot 29, selling to Peckenpaugh Angus, Carthage, S.D., for $11,500. This bull was a son of SAV Brand Name 9115 and out of a daughter of SAV Final Answer 0035. Born at 67 lb., he weaned at 729 lb. to ratio 113. His yearling weight was 1278 lb. to ratio 115. His EPDs were CED 9, BW 0.0, WW 66, YW 112, MILK 25, MARB 0.18, and RE 0.44. Lot 125 sold for $10,500 to Jan Severance, Makoti, N.D. This son of Sitz Upward 307R was out of a daughter of Mr. JT JJ255. They had named him MRA Straight Up 3241 because he was so good "straight up" beginning with a great set of feet and legs. His EPDs included CED 7, BW 1.7, WW 64, YW 110, MILK 30, MARB 0.21, and RE 0.57. He had a 77 lb. birth weight and a weaning weight of 688 lb. He posted a yearling weight of 1170 lb. and a rib eye area of 14.9 sq. in. He had a 42 cm. scrotal measurement. The Skinner Ranch, Hall, Mont., chose Lot 81 at $10,000. This long bull was a son of Apex Windy 078 and out of a daughter of SAV Legacy 7445. With a 90 lb. birth weight, he weaned at 710 lb. to ratio 110, and reached a yearling weight of 1201 lb. to ratio 108. His EPDs were CED 1, BW 3.1, WW 64, YW 104, and MILK 32. Lot 11 was a son of Connealy Final Solution and out of a daughter of MR Right Time 6412. He sold for $9,250 to Payco Holecek, Bowman, N.D. Born at 88 lb., he weaned at 725 lb, and had a yearling weight of 1301 lb. to ratio 117. Repeat buyer Dan Gaskill, Volborg, Mont., bought Lot 59 at $9,000. He was a son of S Chisum 6175 and out of the famous Mohnen Jilt 910 cow (a daughter of Clearwater Paf Seville 1977). He was an embryo transfer calf. His EPDs were CED 6, BW 2.5, WW 56, YW 90, MILK 29, MARB 0.34, and REA 0.53. His scrotal measurement was 39.4 cm. Lot 5 caught the eye of many bidders with the top bid of $8,750 coming from repeat buyer Monty Williams, Box Elder, S.D. Lot 108 deserved the large catalog photo that showed his strong structure. He sold to the Webb Ranch, Isabel, S.D. for $8,750. This son of MRA Pilgrim 0043 was out of a daughter of SAV Legacy 7445. He had a rib eye of 15.1 sq. in., and a scrotal measurement of 37.6 cm. This was a good sale for this ranch. Remember—the hospitality at this sale is second to none. You can not top the shrimp salad and brisket after the sale!